In this post, I’m going to write about a — the? — transition from ObamaCare to TrumpCare from a policy perspective. (This will, of course, immediately (d)evolve back into politics.) First, I’ll look at two high level reasons why changing health care policy from ObamaCare anything else, one from social psychology, the other from the nature of ObamaCare itself. After that, I’ll look at a set of proposals for compromise floated by Bob Laszewski of “Health Care Policy and Marketplace Review.” I’m going to ignore all the various Republican proposals (especially beardless wonder Paul Ryan’s 37-page PDF from his slick “A Better Way” website). The reason is simple: If any of these proposals were both sound policy and “politically feasible” — remember that phrase? — it would have been very easy for Republicans already to have coalesced behind one of them. But if that were going to happen, it would already have happened. The reason was explained by economist Robert Frank in the New York Times on Sunday. People view losses and gains asymmetrically. For example, you have to pay them twice as much to give up a coffee cup they possess as they would have paid for the cup in the first place. Even though the people who are benefiting from Obamacare probably didn’t vote for the people who gave it to them in the last few elections, they might well go vote against any politician who takes their benefit away. According to Frank, “Research on loss aversion … suggests that the repeal would precipitate a political firestorm of epic proportions.” All serious Republican leaders seem to agree with him. Is Mitch McConnell going to vote to take health insurance away from the 231,000 Kentuckians who are newly insured under Obamacare? He has already said he will not. Other Republican leaders have said much the same thing. So, what’s the answer to this problem? Any serious reform will have to grandfather people. Republicans are going to have to make the same promise President Obama made: If you like your plan you can keep it. Yet, with only one exception, letting people keep Obamacare if they like it is not part of any Republican replacement plan. To return to the political for a moment, all the Republican policy proposals are, therefore, a recipe for losing those all-important swing states in 2018 and 2020. Make no doubt. Romneycare was the model for Obamacare. The mandate made its political début in a 1989 Heritage Foundation brief titled “Assuring Affordable Health Care for All Americans,” as a counterpoint to the single-payer system and the employer mandate, which were favored in Democratic circles. So, reminding ourselves of Jeff Sessions’ strictures on “anything goes” post-modernism, we have Democrats (Obama + Gruber) adopting a Heritage-inspired plan pioneered by Republicans (Romney + Gruber), whereupon the Republicans turn around and fight their own plan tooth and nail, while the Democrats, fighting back furiously, never mention they adopted the Republican plan. However, we also find Democrats, Republicans, Heritage, and Gruber in simultaneous agreement that “single payer” is verboten, taboo, unmentionable, “off the table,” and not politically feasible. So all parties noisily and venomously seek “political advantage” at a level of mind-boggling illogic and contradiction, but the real policy conflict — the policy both parties and the political class seek to avoid — is buried, and never mentioned at all. In other words, all the Republican policy changes can really do is tinker round the edges. 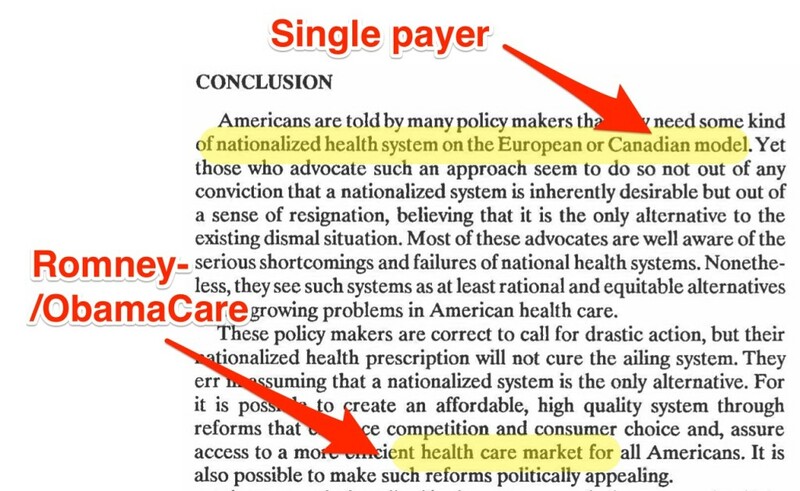 ObamaCare was a (very successful) political ploy to head off single payer. Single payer is, of course, a “universal benefit,” Medicare for All. 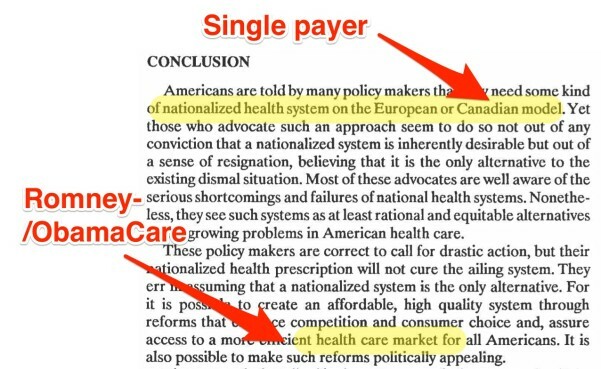 To make ObamaCare “politically feasible,” it to must be seen to be (if not be) universal. But a market-based solution can’t provide a universal benefit. And so we got kludges: Means-tested benefits for those who can’t afford to enter the market is one kludge. Means-tested subsidies plus a carefully rigged “marketplace” are another. The mandate is yet another. The “metals” (Bronze, Silver, Gold, and IIRC Platinum plans) are still another. And all the kludges add up to a ginormous and rickety Rube Goldberg device that randomly sends some people to HappyVille and some people to Pain City, and it’s not really a universal benefit at all. So the Republicans could replace one kludge (the mandate) with another (continuous coverage). Now, people hate the mandate — who wants to be forced to purchase a defective product? — so maybe continuous coverage would be better and more popular policy, but it’s got its own problems, and in any case a kludge is a kludge is a kludge. You can’t buff a turd, as they say. An Obamacare replacement Republicans and Democrats can agree on. Really. It is not a question of whether or not Republicans and Democrats will come to a compromise over replacing Obamacare. Since it will take 60 Senate votes, and the Republicans only have 52 seats, there is no way we can get to a solution to the Obamacare conundrum without a bipartisan compromise. I’m not sure Laszewski’s is correct, technically. For one thing, McConnell could deploy the nuclear option and abolish the filibuster mid-session. For another, without getting into detail on parliamentary procedure, ObamaCare’s replacement could be based through reconciliation with a bare majority, just as ObamaCare was. That said, politically, both seem unlikely: If the filibuster were to have been undone, it would already have been undone at the start of the session. Second, Trump has given the Republicans a free pass to punt on difficult issue, so they are likely to. For Republicans the ability for insurance companies to offer much more flexible plans so that the carriers can fashion plans that consumers want to buy. For Democrats, the requirement that health plans continue to offer the standard Silver Plan as at least one option and that insurers provide detailed comparisons between the standard Silver Plan and any other option the consumer chooses so that consumers know what they are buying. Neoliberal claptrap. For Republicans: The assumption is that people want, and are able, to shop for health care (for which the purchase of health insurance is a proxy). That’s not true. For Democrats: The assumption is that the insurance companies won’t be able to game the system with the “detailed comparisons” they must provide. They have and will. Oddly, in both cases the fact that health insurance companies are profit-making parasites entities ignored. For Republicans, the concept seems to be that “plans consumers want to buy” is the driver, as opposed to profit (let alone plans that actually deliver benefits). For Democrats, the concept seems to be that insurance companies don’t profit by denying care, and hence have no incentive to game the system. For Republicans, enabling low-income consumers to be able to buy a low-cost plan plus a funded HSA for the value of their tax credits. For Democrats, the guarantee that low-income consumers could have a comprehensive insurance plan they could afford by being able to buy into Medicaid with the value of their tax credits, if the consumer decides the market plans available are not satisfactory. For both Democrats and Republicans: First, tax credits won’t help many poor people because most of them don’t pay income taxes. (I’ve never heard of a tax credit working through the payroll tax). Second, think about it: I have health care decisions to make now, in part based on price (since the neoliberals have trapped us in a market). But I get a tax credit, in some unknown amount, at some point in the future. And if the tax credit is hard to calculate, I have to seek out a specialist. Such a deal! For Republicans, establish federal Medicaid funding caps ultimately tied to inflation. For Democrats, phase in the caps over five years. Let the two approaches to Medicaid compete for ten years and then sunset Medicaid funding enabling the Congress to compare the two approaches and the states’ laboratory results for coverage and cost control before moving on. For Republicans: Isn’t establishing a Medicaid cap blaming the victim? I understand the logic of forcing prices lower by the simple expedient of making it impossible to reimburse providers for products or services when the prices are “too high,” but what happens to the patients in the mean time? For Democrats, “Let the two approaches to Medicaid compete for ten years” is what I said it was: “a neoliberal medical experiments on the American people without their informed consent.” Rather than waiting ten years, wouldn’t it be simpler to send Ryan and Wyden on a junket to Toronto, have them ask around, and find out how Canadians like their single payer system? There’s more on the Ryan-Wyden plan here, here, and here. It is true that Laszewski has dug up and dusted off a policy proposal that, in 2012, might have seemed feasible. The political atmosphere is very different today, not only because Republicans and Democrats have little incentive to compromise, but because the Sanders campaign put Medicare for All on the national agenda. Rather than conduct another decade — more than two Presidential terms! — of neoliberal experimentation on the body politic, wouldn’t it be better to advocate solutions known to work? And by giving Republicans cover not to “repair” ObamaCare, Trump also gave cover to Democrats to advocate for Medicare for All as the ultimate framework within which any “repair” must take place. Volatility creates opportunity! It is, of course, possible that the entire Republican caucus will ignore the cover Trump just gave them, take the bit between their teeth, turn Ryan’s PDF into legislation, and pass it. Color me skeptical. Laszewski comes from the health insurance world, but so far as I can know, he doesn’t make stuff up. These days, that’s a real plus. This entry was posted in Health care, Politics on February 6, 2017 by Lambert Strether. The one possibility which never gets talked about is that the Republicans can adopt a Medicare for all solution (under some other name). I realize that this is so far out on the probability curve as to be considered fantastical. But hey – Trump is president. If the Republicans manage to overcome the ideology that requires a market-uber-alles approach, this will be their FDR moment. I may not live to see another Democrat in the White House. The one possibility which never gets talked about is that the Republicans can adopt a Medicare for all solution (under some other name). Maybe instead of Medicare for All, they call it “VA for All.” This ain’t no wussy socialized medicine, this is manly man, camo-print-covered military healthcare for all! This is actually a theory I’ve been holding. Reform the VA with single payer and dump the VA hospitals to get them out of providing medical services. Could be awesome, could be a terrible disaster. I’m interested to see what happens. A single payer system modeled on the VA would be a good idea. The VA works. Oh yes, they have some problems, and some particularly bad hospitals, but overall the VA system does a very good job. In fact, the VA has been rated number one in outcomes consistently even over some of the best hospital systems in the US (Kaiser, John Hopkins, Mayo Clinic). And the VA delivers care a LOT cheaper than the private system and even cheaper than Medicare. The VA does that because it uses a centralized computer system for ALL medical records (no paper whatsoever), negotiates for drug pricing, has standardized preventative care, and numerous wellness programs. Plus, it has a messaging system whereby a patient can contact their provider (doctor, nurse, pharmacy, specialist, whatever) directly and expect to receive a reply if not same day then within 24 hours. We had the same *crazy* idea. Split the majority of profits of the health insurance industry between pharma and hospitals would probably give you buy in from most of the field. Major strides for either jobs or medical care will probably keep Democrats out of power for the next 50 years. They have too much invested in the status quo to change. Its the republicans to lose I think. I’ve proposed this as well. But it currently appears that Republicans/Trump are too dumb to see the opportunity, too blinkered by their donor-sponsored ideology-of-convenience. So we’ll get to watch them flounder around for another 15 months blaming Obama for a disaster they’ll only make worse. Sometimes Occam’s razor applies. They really are that stupid. Again: Trump publicly supported single payer before he ran for the Republican nomination, and might come back to it. He’s also committed himself to a “universal” solution. there’s only one of those. The bigger obstacle is Congress. Even most of the Dems are against it, despite their rhetoric, as 2009 proved. I have believed that the Repub’s have voted against any Democrat health plan because they want it to be their own. They are not constrained by orthodoxy or free market neoliberalism. Witness Bush the Younger’s Part D. See “we gave it to you”, not FDR, not LBJ. So don’t be surprised if the Repub’s find a rationale to create a neoliberal Medicare for all. It is entirely within their governing philosophy. Which is to say, they have no consistent governing philosophy, only crass manipulation of the masses, any subterfuge to stay in control. Believe it. Bernie Sanders has taught them a thing or two already. It’s interesting to note that Canada’s federal Health Care Act of 1966 was in response to single-payer health care programs that began at the provincial level. It other words, it was a bottom-up revolution. I’m beginning to suspect that’s the only way single-payer will become a reality (if ever) in the US. The medical lobby and Big Pharma simply seem to have too great a hammerlock on the US Congress. I think single payer needs to stop being marketed to only those who are without insurance, and refocused toward corporations and those who are on company sponsored plans (which is the overwhelming majority of the population). Do you think corporations are not tired of paying for increasing health insurance costs? It affects the bottom line, and therefore stock prices. And are individuals not also tired of paying ever more for a crappier product? Sell single payer to the masses, in a win win sort of fashion, and maybe it becomes a reality. If enough big corporations get behind it, it becomes palatable to Republican representatives. I’d like to see Bernie sell this in tomorrow’s debate. Alas, I think he’ll instead try to talk up 0bamacare, which will make me become nauseated. I always wonder that myself. Talk about a huge competitive disadvantage relative to the rest of the industrialized world. Well, as it turns out, Bernie has actually done quite well in tonight’s CNN health care debate. He’s banged the single payer, Medicare for All drum all evening, and to (in my opinion) good effect. Exactly. The Canadian-style single payer system that is so admired in this country got its start in Saskatchewan while Tommy Douglas was the Premier. Even today, Douglas is still considered to be the greatest Canadian ever. And, yes, he even beat out Wayne Gretzky in a nationwide CBC poll. But wait, aren’t we always told how superior our system is in the U.S. compared to Canada? Yes, isn’t that great–to have a politician as the greatest Canadian! But, of course, he was more than just a politician: he truly had the welfare of all the people as his main concern–a kind and gentle man. 20 some odd years ago, we (assorted radicals but mainly the California Nurses Association) put a single payer referendum on the ballot and only got about 28% (if memory serves) of the vote. Today, with the demise of the hated Obamacare, I’m hoping the nurses will take the reins again. This time, I’m confident that California will be the US Saskatchewan and we will win; all we need is our Tommy Douglas to get the ball rolling! Interesting discussion. Here’s one along those lines, what if Trump implements medicare-for-all instead of insert random-benevolent-democrat. I know there isn’t much will there (for health care specifically only to be remembered in the history books sure ), but think about what would happen if he did. The first thought experiment is, would it work could it be implemented before his first term finished. I think so, we already have medicare. When medicare is the only option, every doctor will take it. They would probably be as financially well off as they are now. There will be lots of push back, but industries that get left behind don’t do much lobbying. They’ll be forced to spend their money now, or find new growth areas. The rest of the health care industry will probably benefit. Business will see the cost benefits to at least some extent. They would probably be willing to sacrifice the health insurance business for reduced regulations and outsized profits for everyone else. One benefit of having a lower LE than Bangladesh is that desperate people don’t mind the shock doctrine if it improves their circumstances enough. I think the biggest challenge to all progressive policies will be how far Trump chooses to go. Even Bernie can only react and only Trump could push it through. For FDR it was jobs, now maybe its healthcare. Would the baby boomers rather have work until their 80’s or free medical care, and a chance to pass some of their wealth along. If the “liberals” lose any of their “progressive agenda” that’s pretty much all she wrote. A full belly will be enough to turn Trumps negatives completely around. I suspect Trump will go for smaller scale changes that are reasonably easy to pull off, but it does tickle the imagination. For the record I dislike both parties, I do like some irony though. This election cycle was full of it. I noticed that, too. Methinks an error occurred. . . .
Had the same problem. I’ll place here the comment I intended for Water Cooler. Sell the Sanders list to the DNC for $27 dollars a pop and misspell the names. I am amazed that the Republicans haven’t figured this out–if they pull off medicare for all, the Democrats are finished. The problem is that the Democratic Party is already finished. So the Republicans have no incentive to do something most of them have been indoctrinated not to want, or whose salary depends on not wanting it. I was laid off in the summer of 2015 from designing circuits (EE). We were allowed to continue on COBRA for 18 months. This seemed the simplest, expecting to find work. 18 months later I still do not have a full time job, but it turns out I was allowed to continue my insurance since the company I had worked for was in California (I’m in Maine). CalCOBRA allows another 18 months. Given the longer term of my job search, I compared to several plans under Obamacare (in November). I found the results surprising (I’m naive). Any Obamacare plan with similar deductible costs $500-600 per month more (i.e. gold plans). Our current plan (family of 3) costs $2k and has a $2.6k family deductible. Certainly not cheap, but OC plans at a similar price have deductibles of $3.4k to $4.5k (family). Our existing plan has gone up about 10% per year. We’re staying with it until it runs out or full time work happens. I do finally have contract work coming up, likely a substantial amount, just no benefits. We truly have a thoroughly stupid system for enabling citizens to obtain health care. Though Trump has used the term single payer, talked about drug price negotiation*, and said people should have access to health care, has he ever shown any interest by words, actions, or appointments, in publicly funded, highly regulated, publicly accessible, cost-free at the point of service health care or anything else? * which, after meeting with drug execs and lobbyists last week he seems to have replaced with tax breaks and deregulation (that tried and true method of reducing prices and serving the public interest/s). I’ve noticed a lot of the media recently saying that Trump is doing exactly what he said he’d do (for better or for worse). I totally don’t believe it, and this is my favourite instance of the many things he isn’t doing. Of course he isn’t reducing drug prices. It does seem possible (most things seem possible with trump, however good or bad) that single-payer could happen. It’s also possible to make our current model competitive and lower priced by – as he mentions – drug price negotiation, no state barriers, etc. The problem isn’t so much that a private healthcare system couldn’t work, it is just damn near impossible when you have a government as un-democratic as ours. There is no competition because the markets in each state are monopolized or oligopolized (both on the provider side and the insurer side). So, combine a few major hospital networks with one or two possible insurers per state and a pay-to-play legislative process and voila, you’ve got the US healthcare system.. primed to drive up prices and remove competition. Medicare works pretty well – keeping in mind that it takes care of the sickest segment of the population – and it still has to negotiate based off of current private market prices. Imagine what a network of lean, competitive insurers could do if they had actual bargaining power with a competitive network of hospitals and other providers. Both parties are captives .. don’t expect either to escape the gold handcuff they put themselves in. Alexander had the right attitude to legislation … cut the damn Gordian knot, don’t try to untangle it. Note that there exist refundable tax credits where the refund the Earned income tax credit is one. One might assume that any tax credit here would be refundable. Basically it assumes that the tax credit is paid in and so can be refunded. So the issue of folks who owe no taxes might not be an issue depending on how the credit is structured. Ron Wyden, one of my Senators. Sigh. Both my wife and I have tried to pin him down in Town Halls on his opposition to Single Payer. He likes to boast about his “own” plan, which I didn’t realize was co-authored with RYAN. I’ll remember that. Anyway, his arrogance was palpable. He claimed Americans were “not ready” for Medicare-for-all, despite the polls showing supermajority support. By coincidence, another relative encountered him when she was waitressing – in quite a fancy place. She was furious; again, the arrogance was palpable. The way we treat wait staff is unintentionally revealing of our character. In short: Wyden is a slimy character. But the Republicans are so weak here that they can’t find a decent opponent, and he’s deeply entrenched in the Democratic Party. The last Democrat that I voted for was Wayne Morse. It sounds like that Wyden is a slime ball in the mold of the Bob Packwood who defeated Morse after his 6th term and in his 70’s. Everyone who interacts with any of these people in any way, ought to put them in the hot seat about why they don’t support single payer/expanded Medicaid. They should be picketed heckled, you name it.